This post, another written and shared by Gretchen, is a great read. We love Gretchen’s heart – you can see it clearly here. Love the Lord your God with all your heart and with all your soul and with all your strength. These commandments that I give you today are to be upon your hearts. Impress them on your children. Talk about them when you sit at home and when you walk along the road, when you lie down and when you get up. Tie them as symbols on your hands and bind them on your foreheads. Write them on the door frames of your houses and on your gates. The parents of the generation referred to at the end of Judges 2 were those who had seen God’s presence with them in the wilderness as cloud by day and fire by night, who had experienced His provision and protection in the wilderness for 40 years, who had seen Him flatten the walls of Jericho and bring the other miraculous victories that had given them the land in which they now lived. Some of them would have been children when they witnessed how God parted the Red Sea and saved the entire nation of Israel. And yet, a generation arose after them who did not know the LORD. 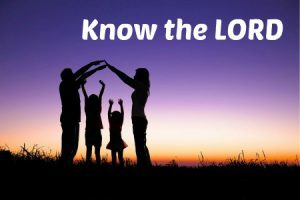 so that they should set their hope in God and not forget the works of God, but keep his commandments…” In the New Testament, too, the Lord instructs parents to teach their children about him. In Ephesians 6, fathers are told to bring their children up in the discipline and instruction of the Lord. These are but a few examples from the whole of Scripture. With the jolting words of Judges 2 in front of us, how do we avoid being the forerunners of a generation after us who doesn’t know the Lord? Certainly, we need to pursue knowing Him more deeply so that our hearts and lives reflect who He is to the next generation. They need to see our hearts being responsive to the Lord and His Word as we live, work, parent, and serve. We need to be transparent about our failures and struggles and the way in which the Lord loves us in the midst of them. And, we need to speak often of His steadfast love and faithfulness through all of joys and sorrows of life. Recently I had the great blessing of hearing a woman in her 80s speak about God’s faithfulness in her life. Her father had abandoned her and her mom when she was a toddler. Her stepfather was killed in World War II. She had grown up to become a teacher of missionary children in the Philippines and had gone on to serve by encouraging missionaries all over the world. As a single—and in recent years, elderly—woman, she had traveled through many dangerous cities. As this lovely woman spoke, she recounted God’s faithfulness to her through all of her life experiences, both good and bad. When she finished, one was not left thinking what a remarkable woman she is (though she certainly is), but rather, what an amazing, loving, faithful God she has loved and served all these years. Though she doesn’t have children of her own, this is the God she has shared with countless children all over the world. She is a precious example of what it means to share with the next generation what knowing God—really knowing Him—means.